NEW LISTING!! One owner, bought directly from the factory new in August 2013. 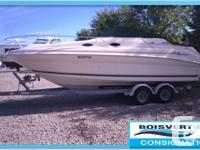 Very well equipped: V-Drive Mercruiser 8.2L MPI DTS with low hours. Warranty on motors guaranteed until August 2017. C90 GPS/Plotter, Radar, bowtruster, electric windlass anchor, generator fifteen hours, lamps under the platform, built in BBQ, upgraded stereo system, Wet Bar, TELEVISION-Cockpit. Complete interior with: central vacuum, thermo-pump, retractable bed, Flat screen TELEVISION, CD-DVD, USB connections, convertible AFT-Cabin lounge with TELEVISION-DVD, fridge + fridge drawer. Too much to list! 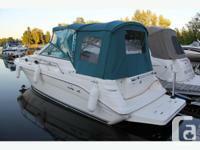 !Dingy with Yamaha 6hp is included.Storage and summer launch included with purchase! North American Yacht Sales Cole Ritchie | Broker T: (289) 668-XXXX E: XXXX@gmail.com W: northamericanyachtsales.comThe company accepts no liability for the content of this email, or for the consequences of any actions taken on the basis of the info provided, unless that details is subsequently confirmed in writing. If you are not the intended recipient you are notified that disclosing, copying, distributing or taking any action in reliance on the contents of this info is strictly prohibited Disclaimer The Company offers the details of this vessel in good faith but cannot guarantee or warrant the accuracy of this info nor warrant the condition of the vessel. A buyer should instruct his agents, or his surveyors, to investigate such details as the buyer desires validated. This vessel is offered subject to prior sale, price change, or withdrawal without notice. Engine Notes Magnum gas and Yanmar diesel V-drives also available. 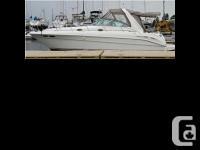 Key Features Standard twin MerCruiser 377 MAG ECT Bravo III sterndrives with Digital Throttle and Shift Mercury Installation Quality Certification - standard 2-year limited engine warranty. Choice of twin MerCruiser sterndrives, V-drive inboards, or Axius propulsion system with helm joystick control Standard SmartCraft Diagnostics with optional upgrades. Weatherproof switch pads and breaker panels with Electronic Interface Modules (EIM). Cockpit wet bar with solid-surface countertop and room for an optional refrigerator or icemaker. Standard SmartCraft digital throttle and shift controls (DTS). Electrically actuated engine access hatch for easy access to the engine room. Wide bench-style helm seat with 2 flip-up thigh-rise bolsters. 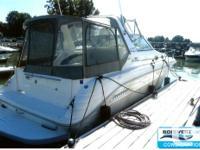 Standard flatscreen TELEVISION with remote Video disc player Wide open, spacious cabin with abundant storage throughout. Large solid-surface galley countertop and abundant storage above and below. Integral swim platform with four-step stainless steel ladder. Water manifold system. 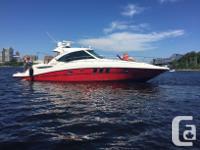 Sea Ray Owners Club membership (available in USA and Canada). Manufacturer Provided Description With the 350 Sundancer, four oversized hull windows contribute to enhanced interior visibility and ambient light. There is a clever aft-facing transom seat, optional cockpit barbecue and flatscreen TELEVISION, and an electrically adjustable forward berth. A plunging sheer line and contoured fiberglass sport spoiler are sure to grab attention wherever you go. Choose your preferred power from gas or diesel sterndrives, or gas inboards.